Hidden away on Bar Beach Road, by the entrance to the lake at Merimbula, many tourists never discover this gem of a place. 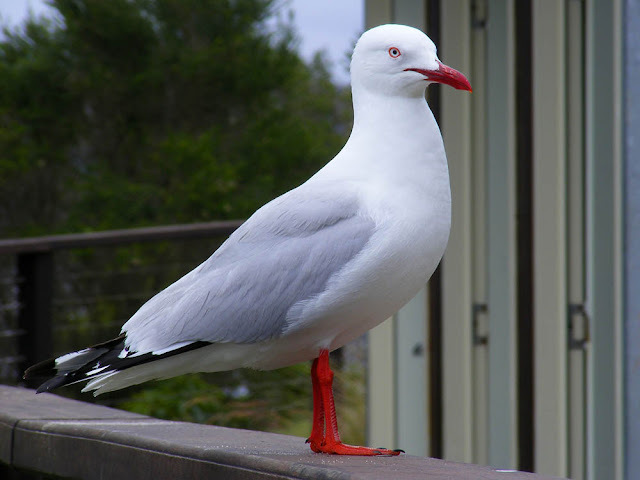 The Silver Gulls Chroicocephalus novaehollandiae are not too pushy, but ever alert for scraps. We were taken there by friends who live locally. 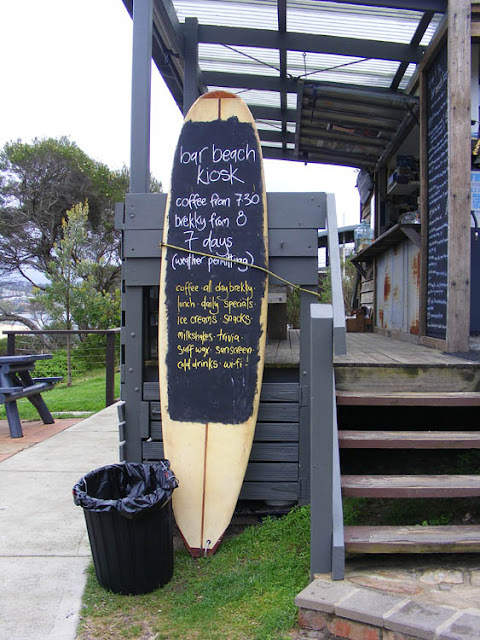 I love the way the owners use Facebook to keep their customers informed. In our kitchen yesterday: I bottled up a batch of preserved orange peel, ready for use in sorbets, cakes and chocolates. 5 litres of chicken stock made, and a litre and a half of vegetable stock. A kilo of peas shelled and blanched. Lunch was dolmades made from our own vine leaves and elderflower cordial made from flowers collected along the bief (millstream) in Le Petit Pressigny. Dessert in the evening was some of the 500 g of freshly picked strawberries and 2 kg of sweet red Géant cherries from our orchard with home made strawberry icecream. I also picked a kilo of redcurrants at Tim and Gaynor's (the cicada is still sitting in the redcurrant bush). The redcurrants have been stripped from their stalks and frozen. Shopping at the market yesterday: a petite boule loaf from the boulangerie (85 cents). A kilo of new ratte potatoes, 500 g peas, a bunch of carrots, 500 g broad beans, 2 leeks, a zucchini, 500 g apricots, 200 g button mushrooms, a bunch of celery, 5 vine tomatoes (total spend on 3 local market garden stalls about €20). 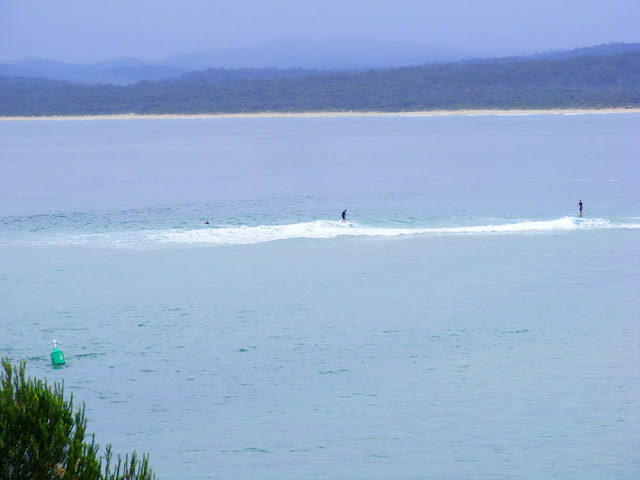 Stand up paddle surfers at Bar Beach, Merimbula, New South Wales. Our friends who live locally tell us it is supposed to be a great body core workout, and has become really popular recently. Actually it recommenced a week ago. 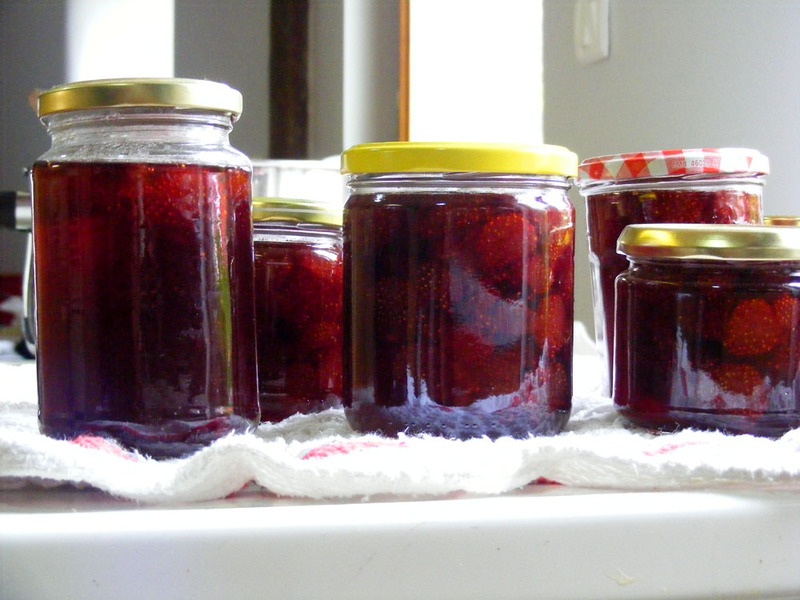 The strawberries are giving generously, so I can happily put several kilos into jam. Amazingly, we've only just finished last year's frozen strawberries, almost all made into sorbet, and I'm stocking up again. Also good has been the rhubarb and strawberry crumble (many thanks to Gaynor for the supply of rhubarb, which sadly does not like my soil). 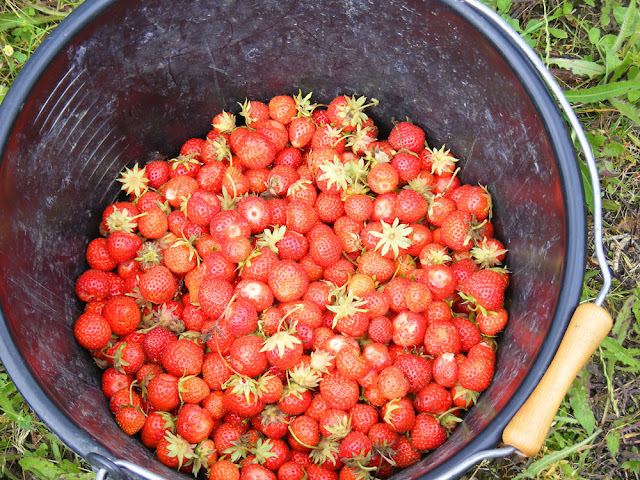 3kg of strawberries from 20 June. I calculate that's an average of about 3 ripe strawberries to pick per plant every couple of days. 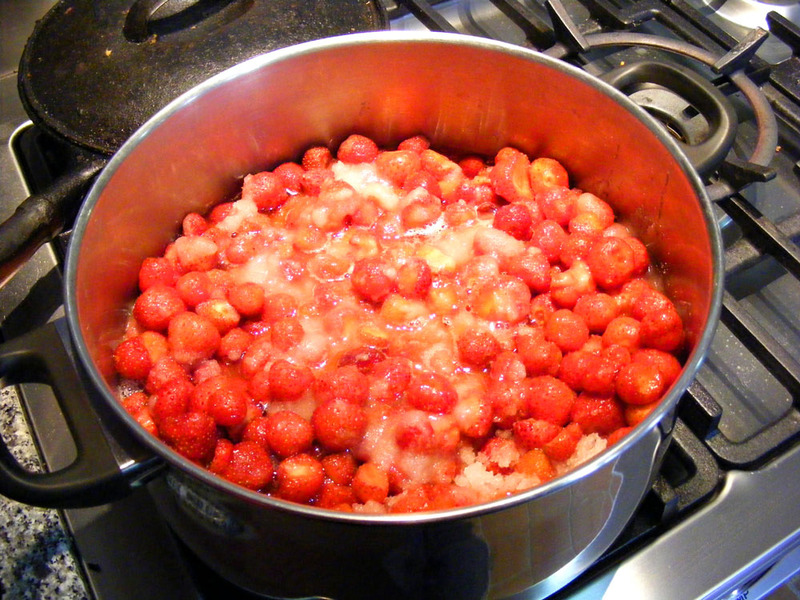 2 kilos of them macerated in the same quantity of sugar for a couple of days before boiling up for jam. With the help of some of my homemade apple pectin from the freezer I've got 6 large jars and 5 small of ruby coloured fruity jam, full of strawberry flavour. So far as I can work out this is a female Tibicina haematodes. They like vines and pines (and presumably red currants if no vines available...) As I left Tim B and Gaynor's garden a male started singing from one of their conifers. Almost everything written about them in the last decade or so and available on the net is by Jérôme Sueur from the Natural History Museum in Paris. Throughout France the summer solstice is celebrated with music. 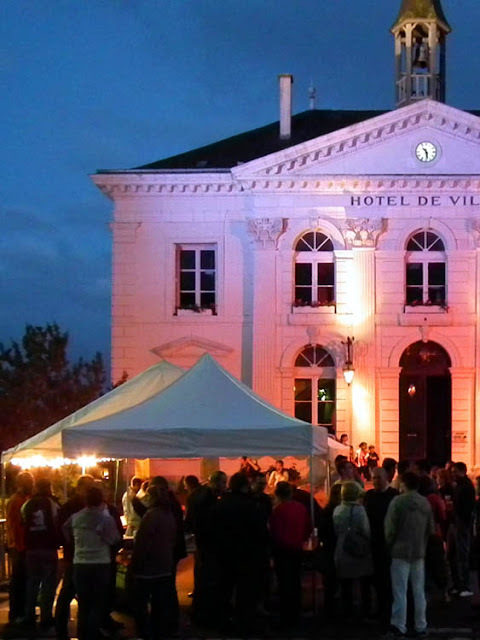 Every year 21 June is la Fête de la Musique and every town stages a live free concert for the community. This year in Preuilly the weather was unreliable and the music was outdoors, so very few people turned up. 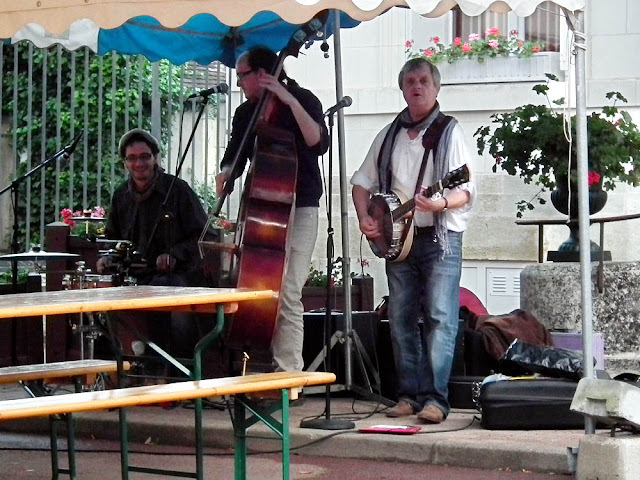 It was sad for Les Débranchés ('The Unplugged / Disconnected'), the very good jazz / blues trio who performed. Orchard News: Clafoutis production has begun, as of yesterday, with 500g of sour cherries going into 6 individual puddings. 1.5 kg sweet red cherries and 500 g sweet yellow cherries were turned into compote (stewed, in other words) last night. The birds got a lot of the yellow cherries, as I misjudged their ripening speed. The red cherries came from Tim and Gaynor's. 500 g strawberries made into icecream. 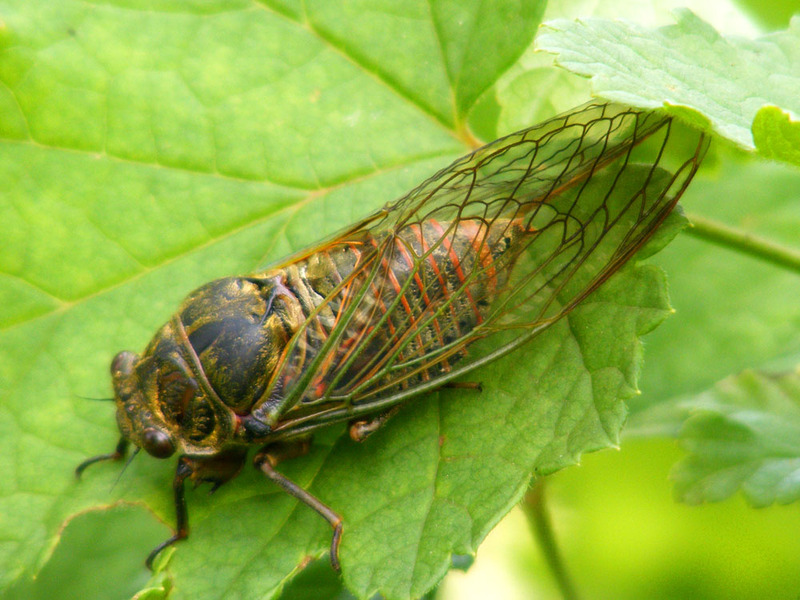 It must be summer now, as I saw a large cicada sitting on the red currant bushes at Tim and Gaynor's while I was over there yesterday picking cherries. In our orchard we have one more sweet cherry to pick, which I think will be ripe in a couple of days, and four sour cherries which are just starting to have some ripe fruit. The nectarines are coming along nicely and it looks like I should get a good crop of the small white ones from the old tree by the potager gate. A photo from Villandry, 18 June 2013. At about 5.30 am last Monday morning there was an intense hail storm over Tours. We had a client to meet at 9am in central Tours on Tuesday morning and were amazed at how littered Boulevard Heurteloup was with leaves and twigs from the plane trees that line the street and shade the central parking. The street was literally carpeted, even after 24 hours. 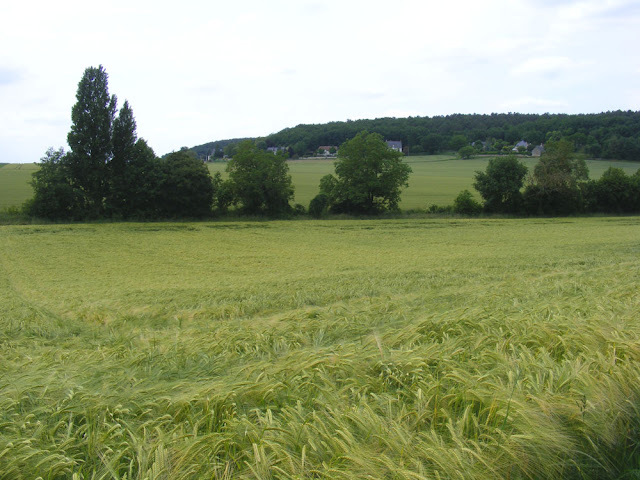 The farmland around Tours has been badly affected, with vineyards in Vouvray particularly hard hit, as well as canola crops in the area destroyed and sunflower seedlings shredded. The egg sized hailstones fell for about 15 minutes and simply shredded the vegetation, punched through slate roofs and dented cars. The vineyard workers reported finding dead rabbits and birds amongst the vines too. For some dramatic pictures of the worst of it, see the local newspaper report. Our winemaker friend Alexandre Monmousseau, who owns Chateau Gaudrelle in Rochecorbon, posted photos of the damage on his Facebook page and it was a sorry sight. We called in to see the team at Gaudrelle on Tuesday evening and Alexandre updated us about the situation. Many of the 180 vineyards in the Vouvray appellation have been affected. A few have lost their entire crop before it had even got underway for this year. Some have probably lost about 75-80% of their crop. Most, like Chateau Gaudrelle, estimate they have lost 50-60% of this year's crop. Not many have been lucky enough to escape with under 30% losses. A few winemakers will lose their vineyards or certain parcels because the damage has been severe enough to kill the vines. 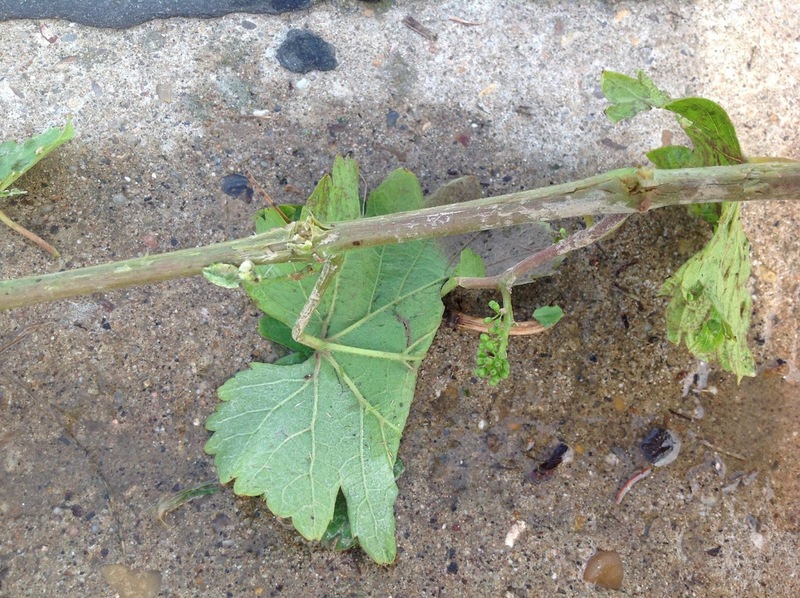 The vines have many jagged wounds and the weather remains warm and wet -- a recipe for a mega-fungal outbreak if ever there was one. Those who will be most affected are those who are only just starting out and those who are not insured against hail. Hail does not fit the government criteria for declaring a natural disaster, so even those who are insured will have to be assessed and compensation payments may take a long time to reach those who need them. If the event had been officially designated a natural disaster, the insurance companies must pay claims quickly and without haggling about details. However, some government assistance will be forthcoming and the appellation is being very pro-active in ensuring all its members feel supported. This hailstorm comes in the wake of the reduced 2012 vintage. 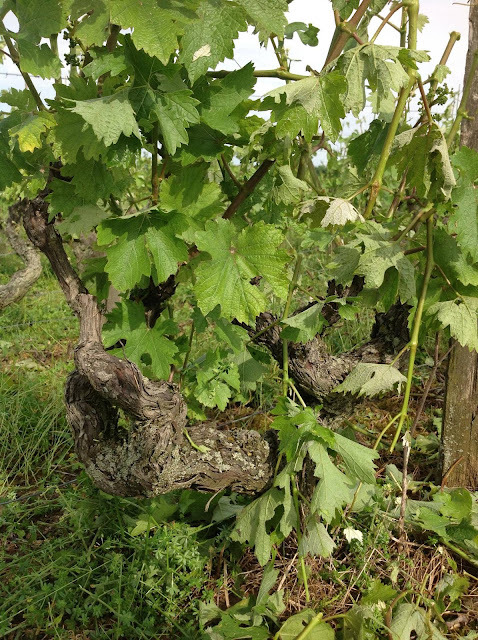 Due to poor weather all last year, most vineyards in Vouvray, and throughout the Touraine as a whole, only managed about 50% of their normal output. 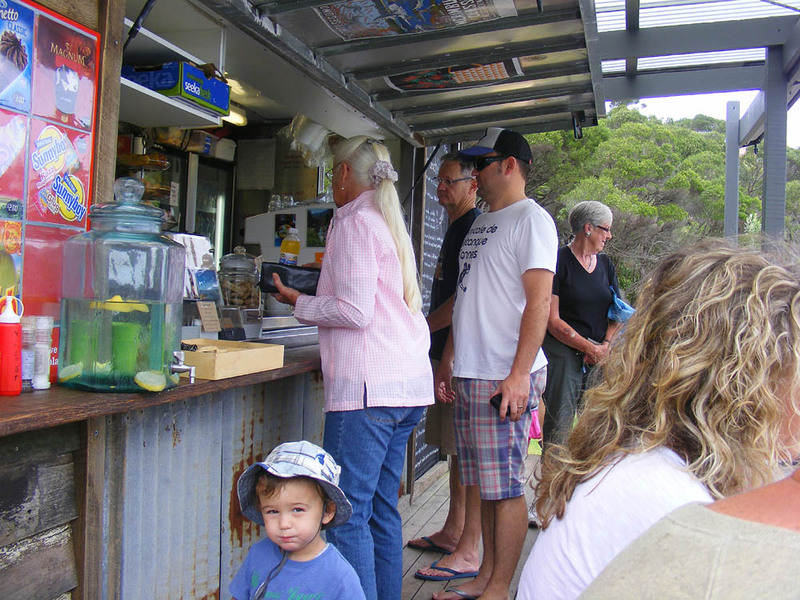 With two years in a row of reduced quantity, some wineries will struggle to meet their commitments to suppliers. In Chateau Gaudrelle's case, they have arranged to buy grapes from partner vineyards in Vernou-sur-Brenne (also part of the Vouvray appellation) who fortunately were not affected by the storm. When we saw Alexandre he told us that it was very difficult initially to assess the extent of the damage. For a day or two, the vines remain green, but after some days more and more vines start going brown. 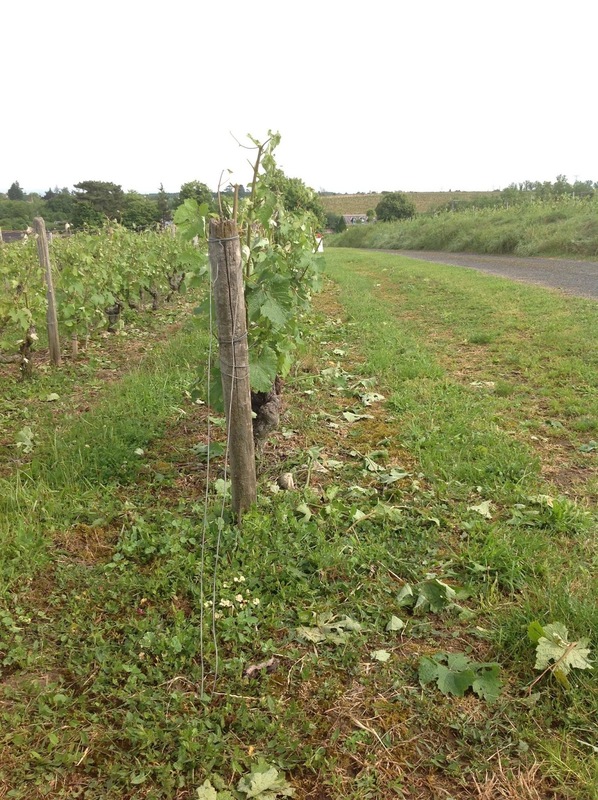 His vine master Guillaume sprayed against fungal disease immediately after the storm, but it rained heavily again and his effort was wasted. On Tuesday evening he was out in the vineyard again, spraying fungicide. The site is steep and the ground slippery. 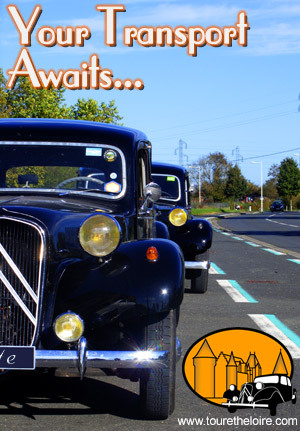 Alexandre said that every time an emergency vehicle passed with its siren going, he hoped it was not for them. It is all to easy to tip a tractor over in such conditions, but Guillaume insisted the fungal treatment must be done immediately to prevent further threat to the vines. We will continue to support the Vouvray vineyards, and Chateau Gaudrelle in particular, by visiting regularly with clients and spreading the word about their great value, high quality wines. 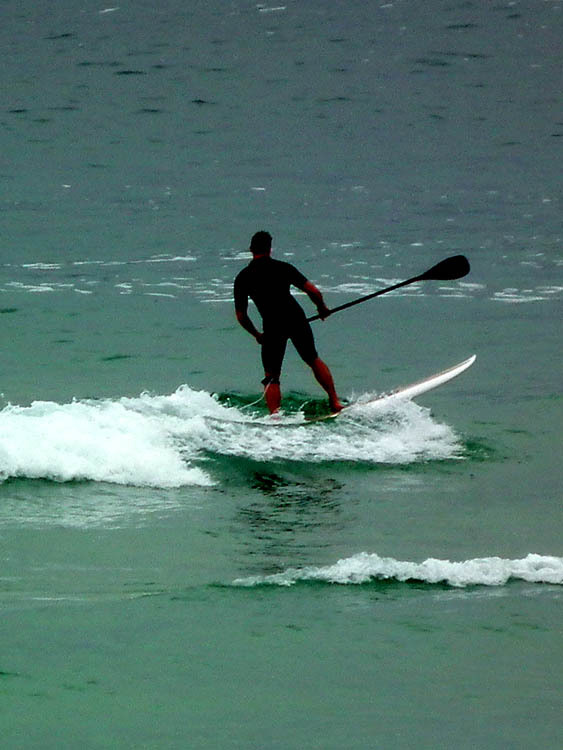 Photo credits: All photos on this post are courtesy of Alexandre Monmousseau and Chateau Gaudrelle. They were taken by Alexandre on the Chateau Gaudrelle estate on the day of the hail storm, 17 June 2013. Chinon and Richelieu Storms: Chinon and Richelieu have also been hit by torrential rainfall, on Wednesday, with added golf ball sized hail. The vineyards here have mostly had a lucky escape, with much less damage overall. 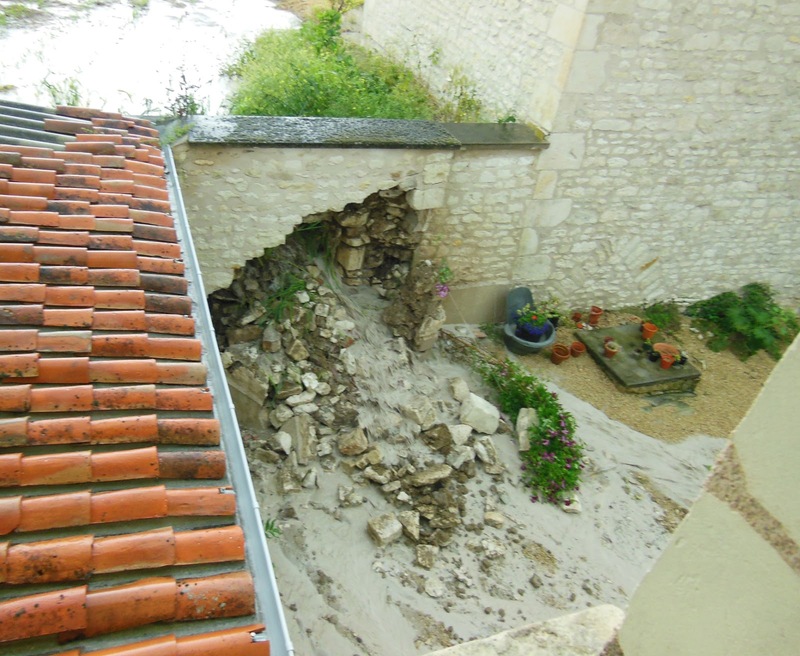 Most of the problems around Chinon and Richelieu have been from water causing erosion and subsidence or collapse and the event has been declared a natural disaster (so insurance claims will be fast-tracked). Our friends Colin and Elizabeth posted pictures of their garden and road at Braye-sous-Faye. On Saturday our friend Annie emailed me a picture of the new water feature in their courtyard at Champigny-sur-Veude (I must say it looked remarkably like the wall had collapsed, but Annie said she was rather enjoying having a stream running through the garden!) Check out Annie's new exhibition in Berlin, by the way. 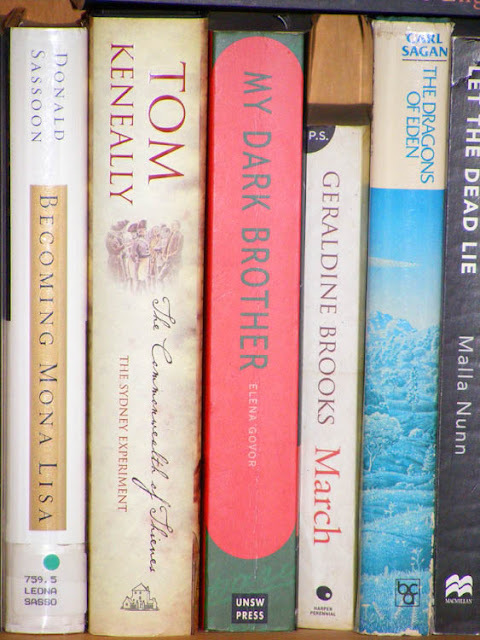 Photo courtesy of Botanical Annie. Still, it's nothing compared to the floods on the French-Spanish border and along the big central European rivers through the Czech Republic and Germany, or indeed the poor sods in northern India. 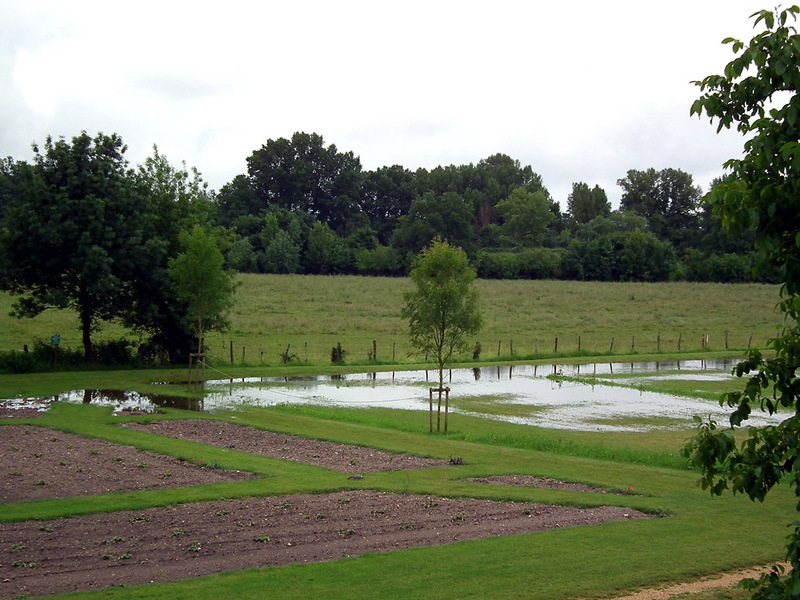 UPDATE: L'Eminence Rouge has also blogged about it and posted pictures of flooding in Richelieu. Many flooded cellars and gardens. On Sunday 16 June the Association de Botanique et de Mycologie de Sainte-Maure-de-Touraine sallied forth from l'Ile Bouchard to a limestone ridge just outside the picturesque village of Panzoult. The main drawcard was the magnificent display of the rare and protected orchid Red Helleborine Cephalanthera rubra that one can expect at this site in the middle of June. They did not disappoint, but the site has a wealth of other rare and protected plants too, and I saw several species new to me. Sadly we did not have the opportunity to visit the dovecotes in the area, which are apparently outstanding (although I am told not in very good condition). I took a great many pictures on the outing and really struggled to choose just a few highlights for this blog post. Almost everything I photographed was another highlight! 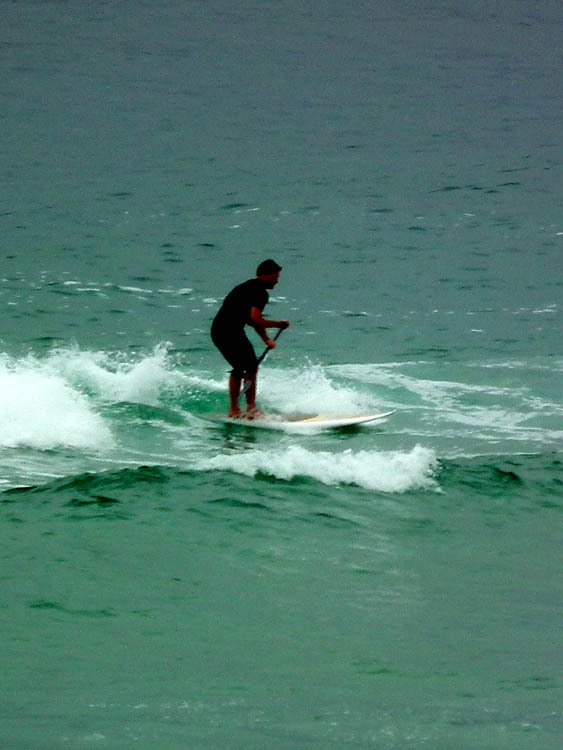 Adding to our enjoyment of the day was the warm sunny weather -- a real rarity so far this year. 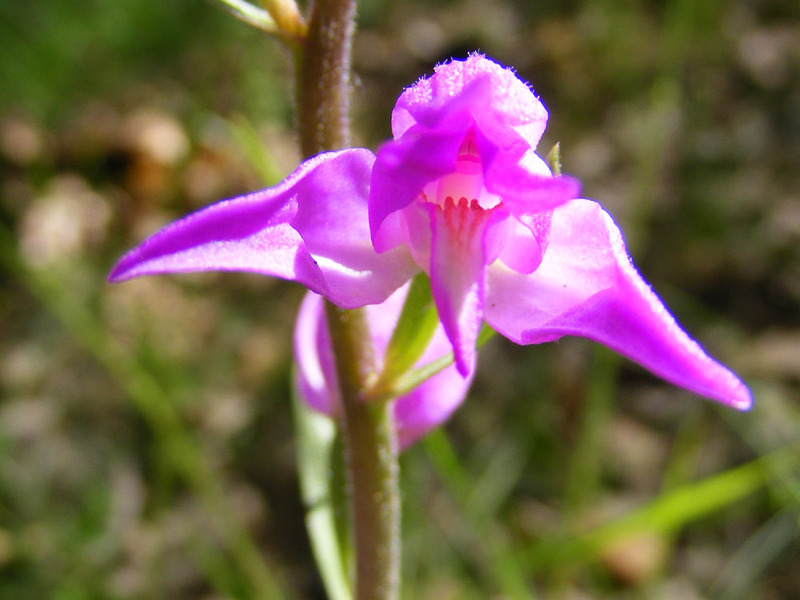 The object of our visit, the lovely Red Helleborine. It was growing everywhere, and many of the flower stems were considerably taller than I had seen before. 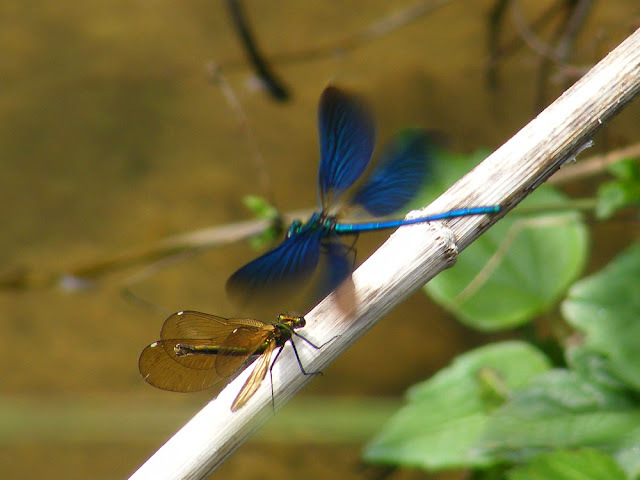 These Beautiful Demoiselles Calopteryx virgo were exhibiting some interesting courtship behaviour on vegetation over a small stream. The green and bronze female was wing flicking and 'tail-lighting' (raising her tail so the pale underneath was visible). If you see a male demoiselle doing this he is signaling aggressive defence of a territory. Presumably it means something quite different if done by a female, as this male persisted in his approach, eventually landing on her and grasping her behind the eyes as a prelude to mating. If the female had been reluctant to mate she would not have been hanging around in the male's territory anyway. 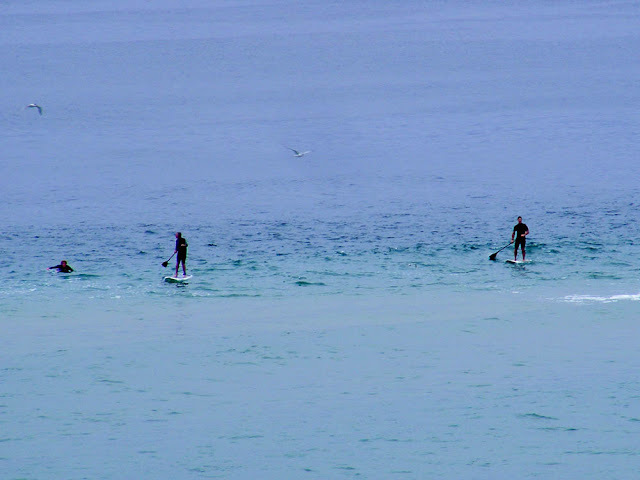 There were about 4 males and the same number of females in just a few square metres. 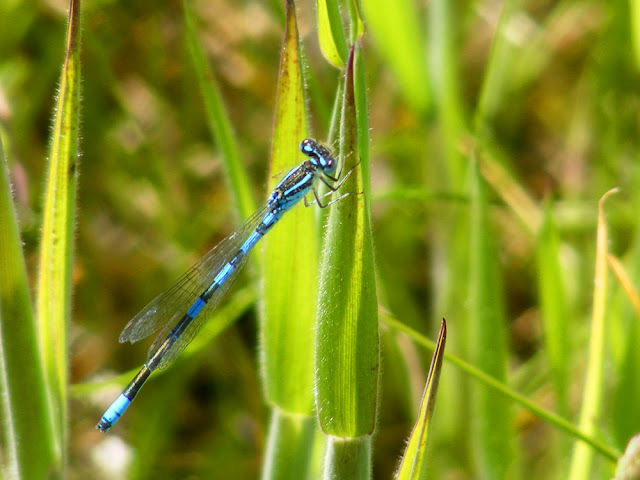 These small streams are very important for the Beautiful Demoiselles, which are pickier about where they will breed than the more common Banded Demoiselles C. splendens. 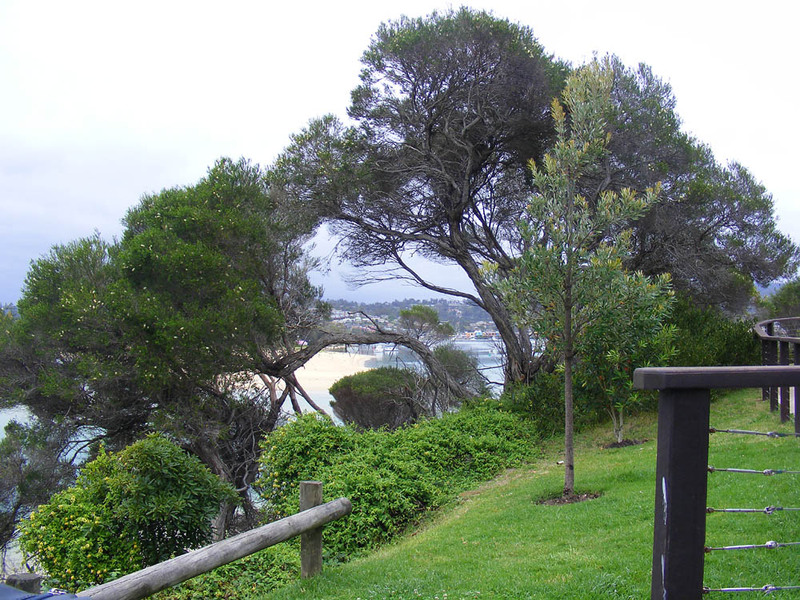 The Beautifuls like shaded, colder, more aerated faster flowing water over a clean gravelly or sandy bed. 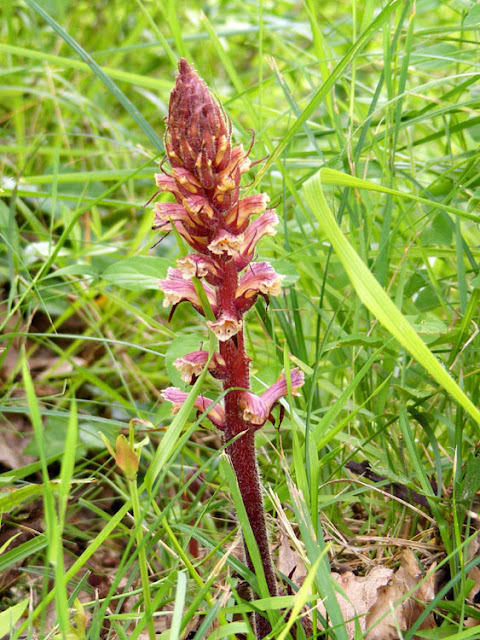 The striking chlorophyll free root parasite Ivy Broomrape Orobanche hederae was sending spearheads of flowers up from the ground in large numbers. The view over the vallon. We walked from the house on the right in the distance, in a big arc, crossing the stream halfway. It's a beautiful place, and the barley crop is looking very good. I was told they are expecting a good harvest. Barley is the most important cereal grain used as stock feed here, and is one of the first crops to mature and be harvested. This is a high yield low protein winter two-rowed non-shattering Hordeum distichum variety according to François, one of the professional botanists in the club. He also passed a comment to the effect that farmers are choosing barley varieties on the basis of their high yields, regardless of whether the cattle like them (which I gather they don't, and my further reading suggests that summer barley with high protein is the more usual choice as stock food, and the winter barley is used for malting -- I will have to quiz him further about this). 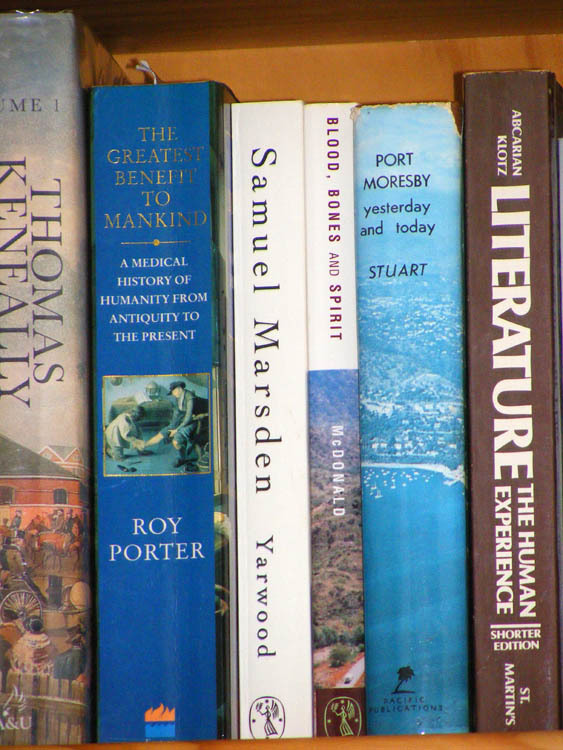 More information from readers in the know would be welcome. Barley is by far my favourite crop visually, as it looks beautiful for the whole of its time in the ground. 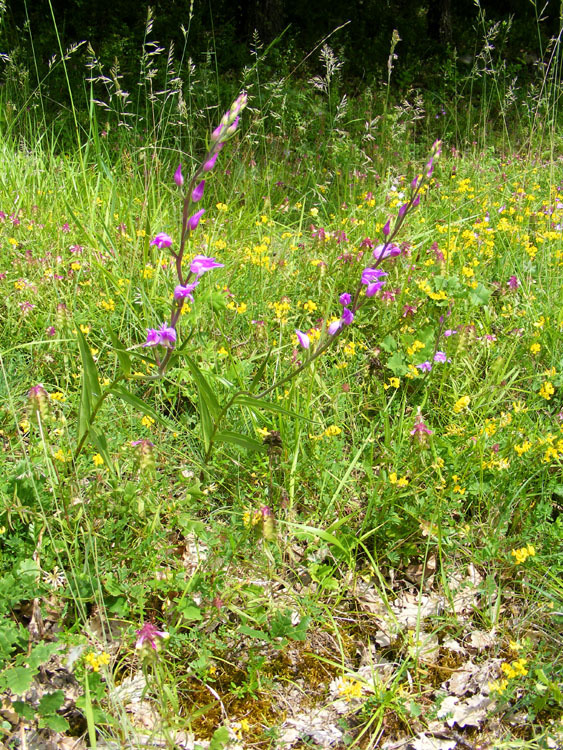 Ecologists talk about flower-rich grassland a lot. 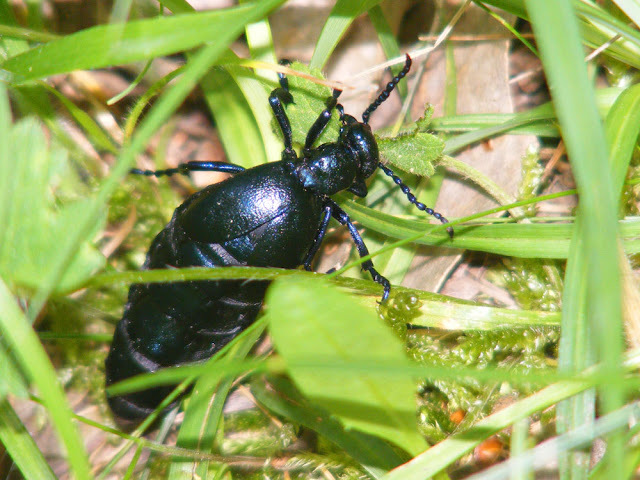 It is the ideal habitat for many species of insects and should exist in vast swathes across Europe. Sadly it no longer does and its loss is one of the main reasons for severe declines in certain plant, bumble bee and butterfly species. I think the picture below gives you an idea of what a good natural flowery grassland should look like. The main flowers you can see are Red Helleborines, Crested Cow-wheat Melampyrum cristatum and Common Birdsfoot Trefoil Lotus corniculatus. 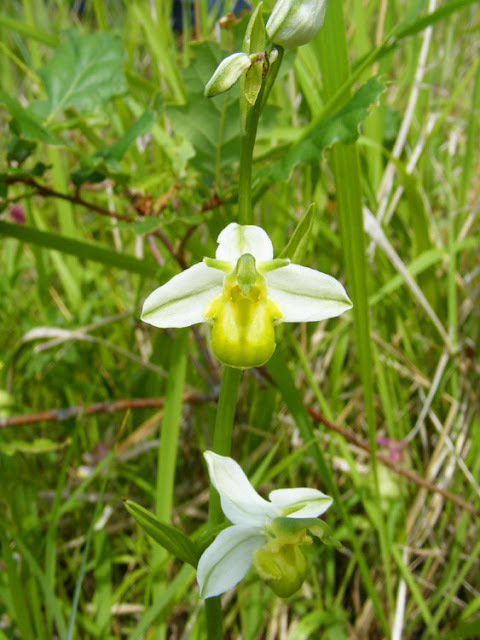 The first two are rare and localised chalk grassland specialists, the third is common in all but very acidic soils. An unusual hypochromatic Bee Orchid Ophrys apifera var flavescens. A normal Bee Orchid is pink and brownish, like this one in our orchard. These hypochromatic individuals have a mutation which means they lack (or are very low in) all except a yellow pigment. 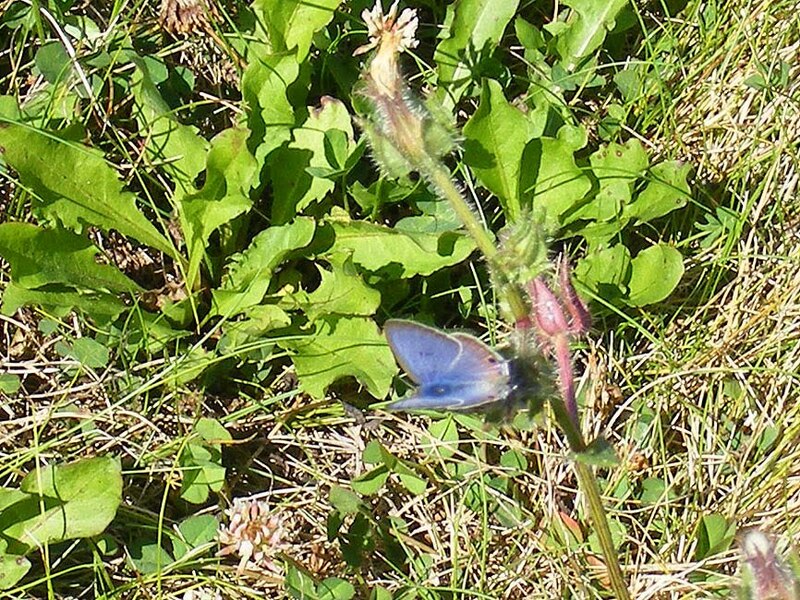 There were at least two of these in the grass at Panzoult. 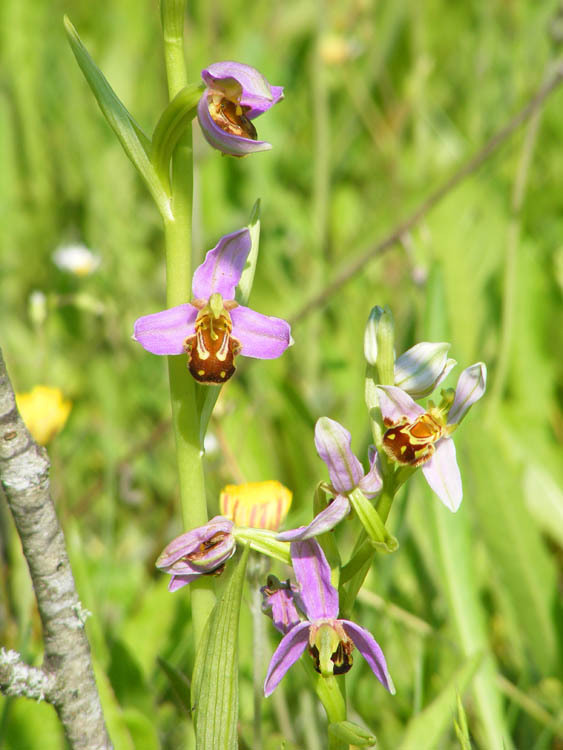 Bee Orchids are very prone to mutations, which I presume is a by-product of the fact that they frequently self-pollinate rather than rely on insect cross-pollination services. 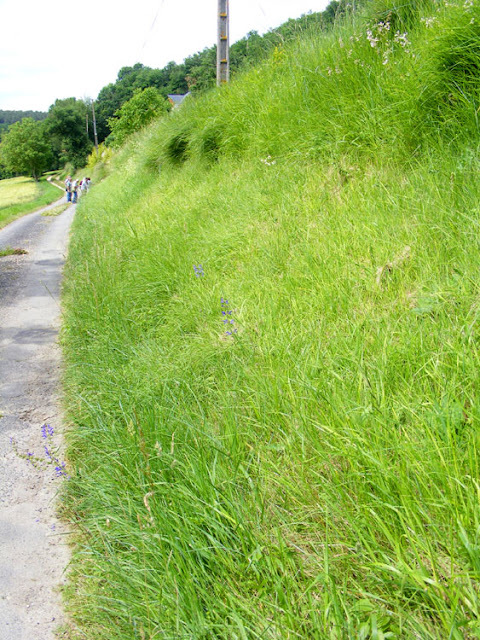 These sorts of grassy banks and roadside verges are becoming an increasingly important habitat network. François had quite a lot to say about local authority's roadside management practices and has worked out that the area of verges in the département roughly equal a sizeable National Park. He pointed out that for decades the local authorities have been making a rod for their own back by frequent mowing. The mowing and the fact that the clippings are not removed make for an ever increasingly fertile strip of land, with ever increasing rates of growth. 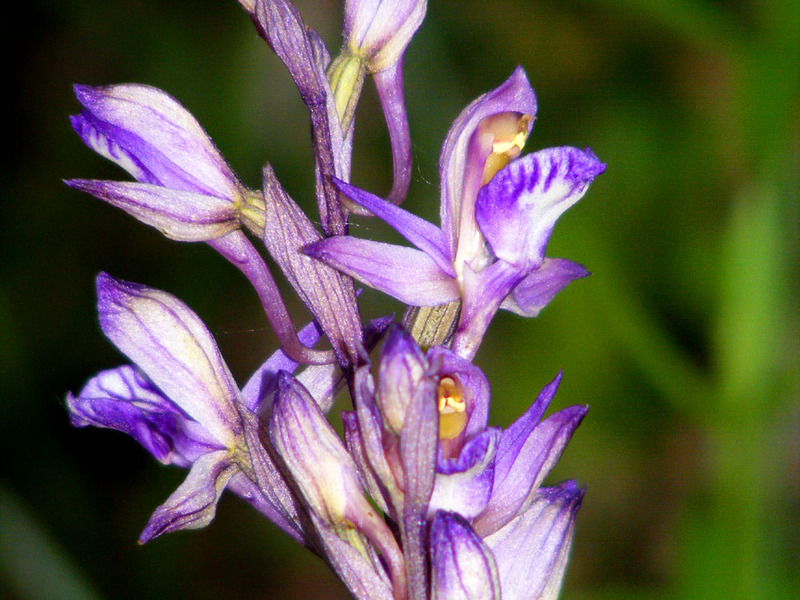 Plants like nettles that thrive on the increased fertility were increasing, plants like orchids that need low fertility were decreasing. One good thing to come out of the economic recession is the willingness of those who control the purse strings to listen to the conservationists when they mention win-win approaches such as a reduction in mowing. It began with fauchage tardif (late mowing), which was a good start, but François reckons that the local authorities still didn't quite get it and mowed everywhere between 1 and 15 September, whether it was necessary or not. Now some authorities are displaying fauchage raisonné (intelligent mowing) signs. This is much better. These local authorities are restricting mowing at intersections to a short distance in each direction, and often not mowing at all in the autumn, but waiting to see if the frost will do their work for them. Not only does this save fuel, time and other resources, but the routine restores a more natural balance for the plant life, encouraging and protecting a wide range of wild flowers. Plus the shorter range of visibility means that drivers are more careful and drive slower. François would like to see it go even further, as he thinks the collection of clippings for rabbit and goat food should be routine and maybe even some grazing along the roadsides could be reintroduced. 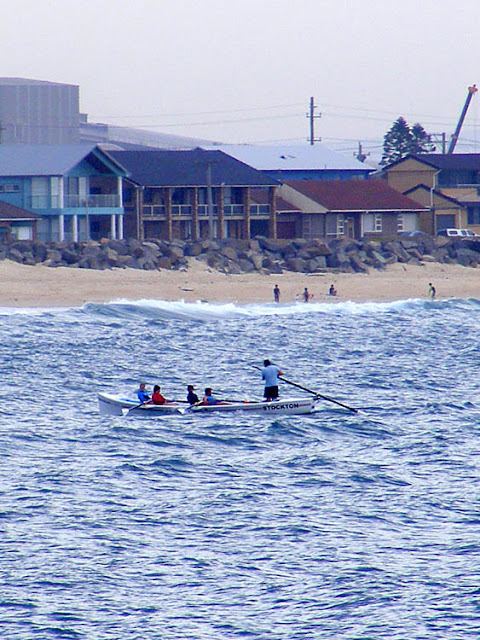 A team of surf boat rowers practice at Stockton on the New South Wales coast. Surfboat rowing is supported by the surf lifesaving clubs and by the Navy. Modern nylon fishing line is an environmental nightmare, frequently garrotting, incapacitating or amputating limbs of wildlife that encounters bundles of abandoned tangled line. 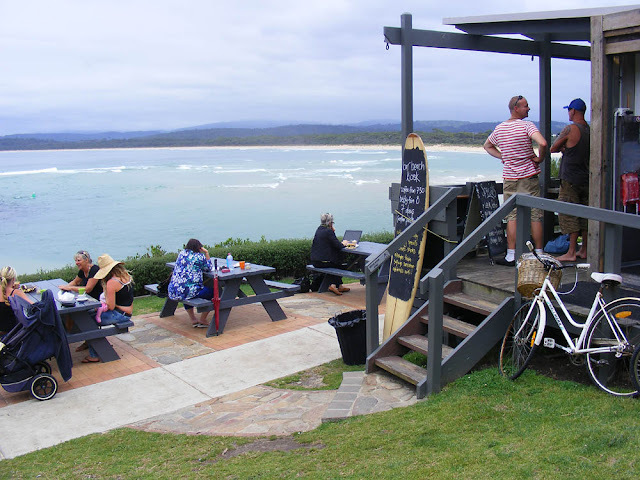 This simple bin on the Old Wharf at Merimbula on the New South Wales coast neatly solves the problem -- so long as anglers and walkers take on the responsiblity of disposing of their own and others' line. 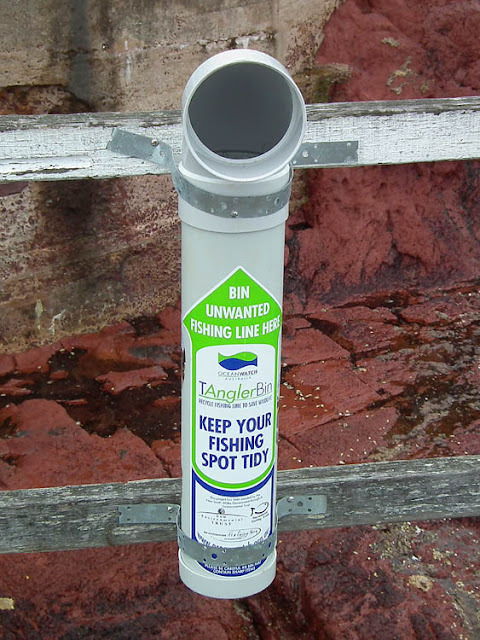 The supply and fitting of these bins is the sort of thing your fishing licence goes towards paying for in New South Wales. To download one of our posters for your area, go to this link about our poster campaign. Many thanks for helping if you can, we really appreciate you taking the time. 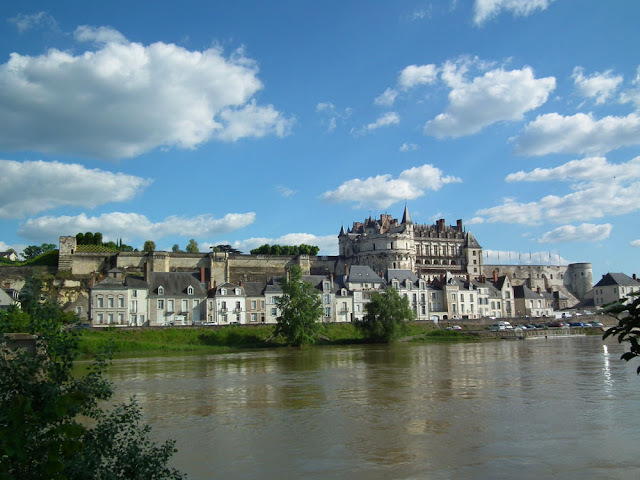 Did you know that we also write a blog about touring the Loire Valley with Célestine? 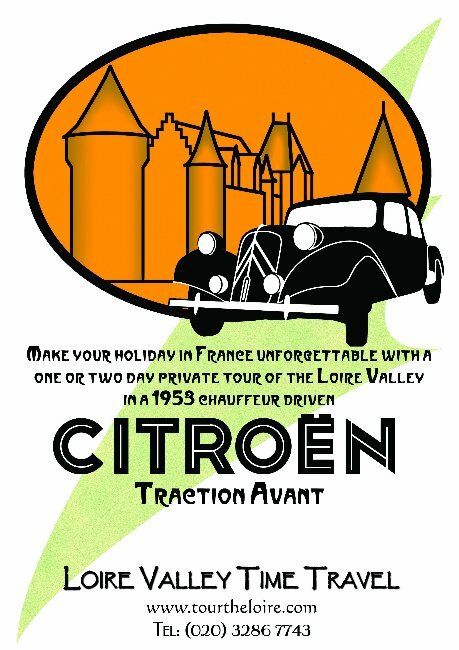 We hope it is a good read not just for potential clients, but any visitor to the Loire, and update it every 10 days or so. Plus, Simon is experimenting with a mobile website for those of you who use a smart phone. At the moment he's struggling with how to make the regular website redirect automatically, but if the link doesn't work properly and you are interested you can find the mobile site here. Any feedback will be welcome. 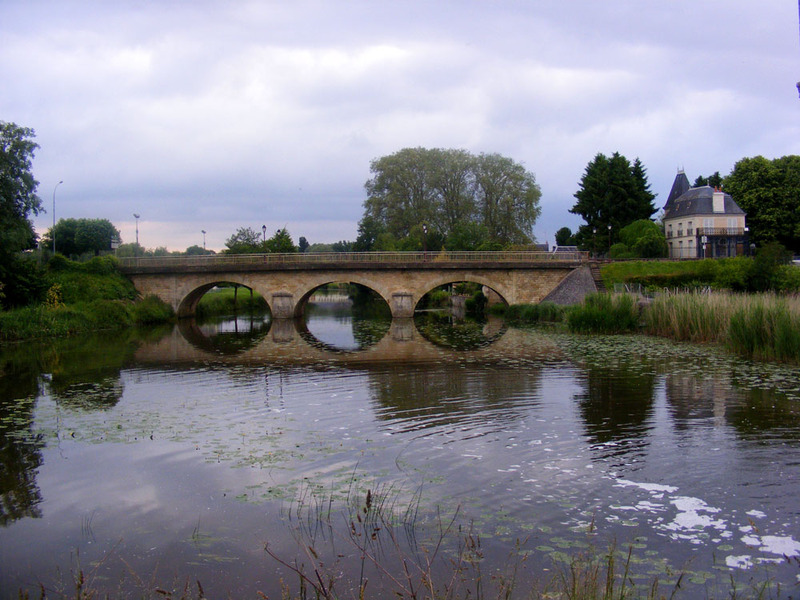 The 'new' bridge over the Claise in Preuilly-sur-Claise, taken at dusk from the old bridge. There is a received wisdom that the false eyes that form part of the pattern of many butterflies has evolved to allow them to fool and thus evade bird predators. However, one researcher in the US recently wondered if it might be used against a much smaller, but perhaps deadlier butterfly predator. 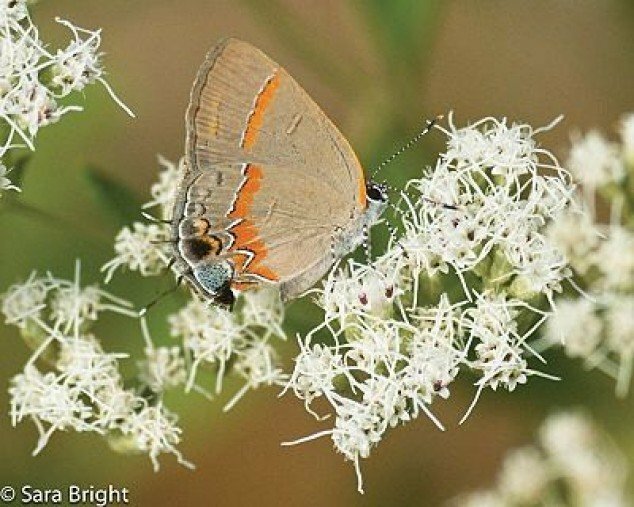 He began to conduct tests with an American species of Hairstreak butterfly, a member of a family of similar looking species that exists more or less world wide. 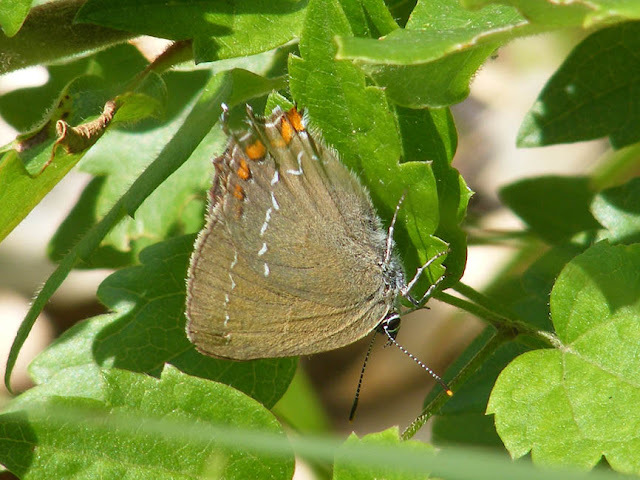 Ilex Hairstreak Satyrium ilicis, photographed at Chaumussay last June. He discovered that his Hairstreaks successfully evaded jumping spiders every time, despite laying their eggs in an environment where the spider was abundant and persisently hunting. When he tried the jumping spiders on other species of lepidoptera, the spider caught the butterfly or moth every time. His conclusion was that Hairstreaks had evolved false eyes to evade spiders and other small arthropods, not birds or other large vertebrates. With the Hairstreaks though, it's not just a matter of having false eyes. They have a false head, made up of the eyespots and their tails. The butterflies shuffle their wings constantly, as if they are drawing attention to themselves, and indeed, the scientist, Andrei Sourakov, noticed that the shuffling and shimmying increased when there was a spider present. The spiders seem to be hard wired to attack what they think is the head end, and will carefully move around a butterfly in order to position themselves appropriately. 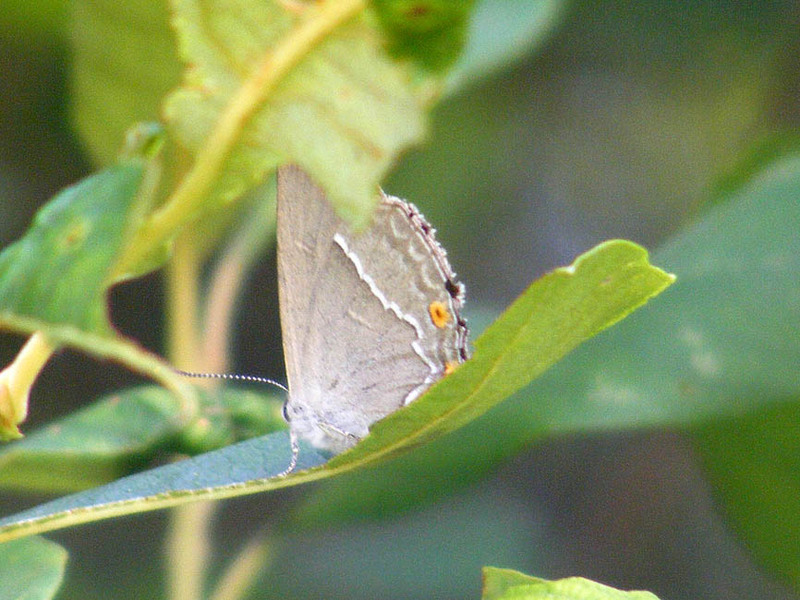 In the case of the Hairstreaks, the spider always attacked the false head, not the real one, and as a result, many Hairstreaks lose that section of their rear wings, but live to fly another day. 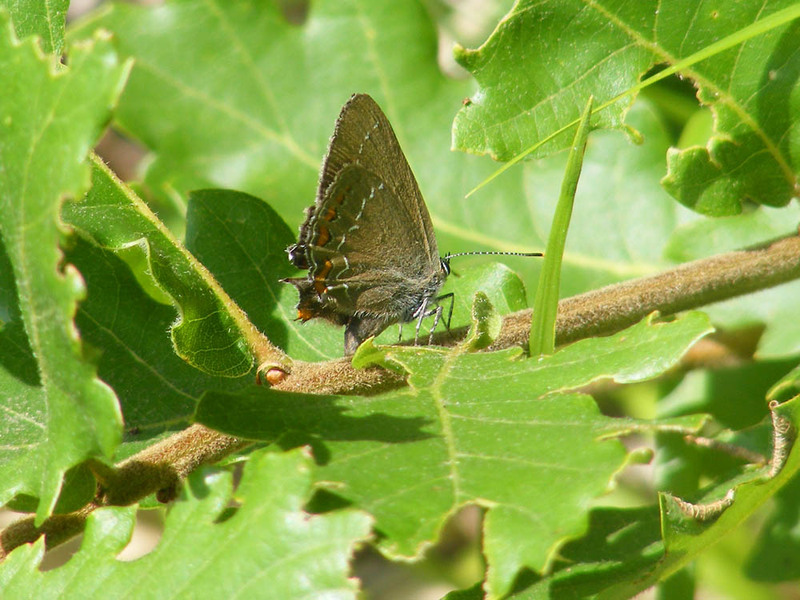 Purple Hairstreak, Neozephyrus quercus, photographed in the Parc de Boussay, July 2011. I suspect that this behaviour and evolutionary response also applies to other false eyed and tailed butterflies, such as the Short-tailed Blue Everes argiades and the Long-tailed Blue Lampides boeticus. I also think that the arachnid enemy here might be crab spiders. I've seen several of the beautiful red and black crab spider species Synaema globosum lurking about in the same Downy Oak tree at Chaumussay that I know the Ilex Hairstreak lays eggs in. They are less than a centimetre long, but will take prey the size of a Honey Bee. Black Hairstreak Satyrium pruni, in the Brenne. Photograph courtesy of Tim of Aigronne Valley Wildlife. The study also calls into question the visual acuity of these spiders -- maybe it's not as good as previously believed. The huge chateau of Amboise sits in the village of the same name, overlooking the Loire. It used to be even huger, but much of it has been demolished, leaving only a massive curtain wall and a much reduced remnant of the chateau. It makes a great driveby and photo opp from the island in the river, but doesn't make it very high up our 'full visit' list as so much of the interior is 19th century. The best bits are the ramp for riding into the castle, and the chapel, which is a lovely 15th century flamboyant gothic building (but even it has 19th century glass, and a grave that might contain Leonardo da Vinci's remains, although they were rather too conveniently 'rediscovered' and moved here from the site where they were originally buried). We were talking to a local gîte owner recently who said he was amazed by the number of people who visit the chateau but never make it to the chapel. Considering the amount of interest in Leonardo since Dan Brown's popular fictional tale, I'm amazed too. The chateau does feature significantly in the lives of the Valois kings though, so it is always nice to see the place which links so much history together. It was here that Marie d'Anjou raised the 14 children of Charles VII, and many subsequent royal children grew up here. It was here that the young Charles VIII ran through a doorway, hitting his head on the lintel and fatally injuring himself. And it was here that François I spent much of his time while he waited for the completion of the palatial hunting lodge of Chambord that will forever be associated with his name. 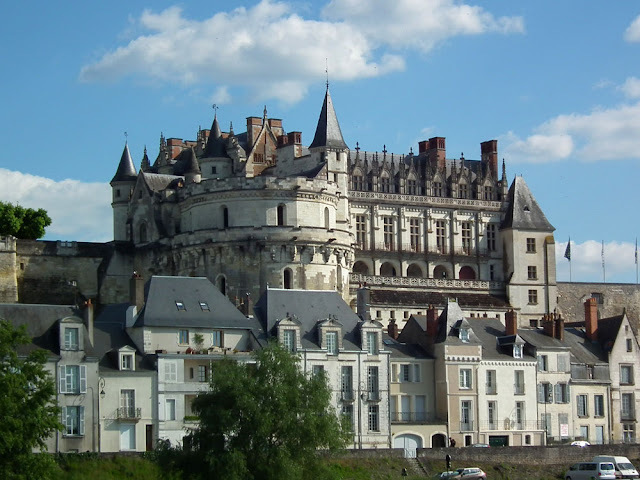 Update: and as Fly pointed out in the comments, not forgetting the Amboise Conspiracy in 1560, when the bodies of 1500 Huguenots associated with a plot to assassinate the young King François II were suspended on hooks from the façade of the chateau. After a pause of 18 months when no work on the house took place, a little gentle bricolage has now recommenced. We didn't intend the break to be so long, but renovating takes it out of you. Sitting in boxes in our graineterie we have the light fittings for almost every room in the house. The bulk of the wiring for the house has been done for a couple of years, and so putting the two together is a quick win. The office light in action. Simon has fitted the wall light in the office. Up till now we have had a light bulb hanging precariously from some exposed wires. It worked, but wasn't elegant. Now we have a neat black metal 'officey' looking light fitting above the window. 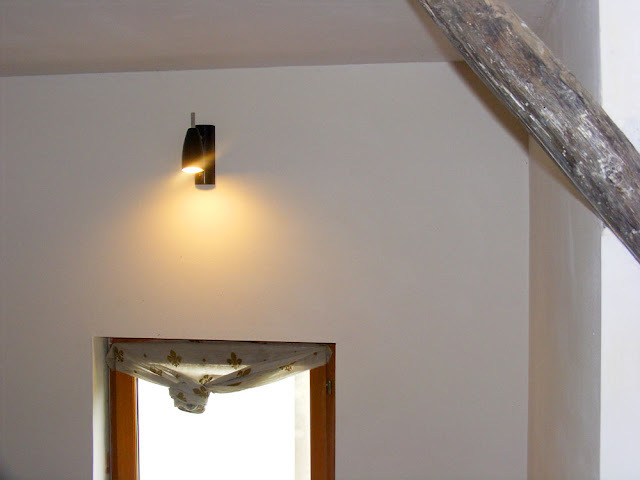 He has also drilled out a hole in the stone and fitted the va-et-vient (two-way) switch for the dining room, which was previously just swinging about on its cable. 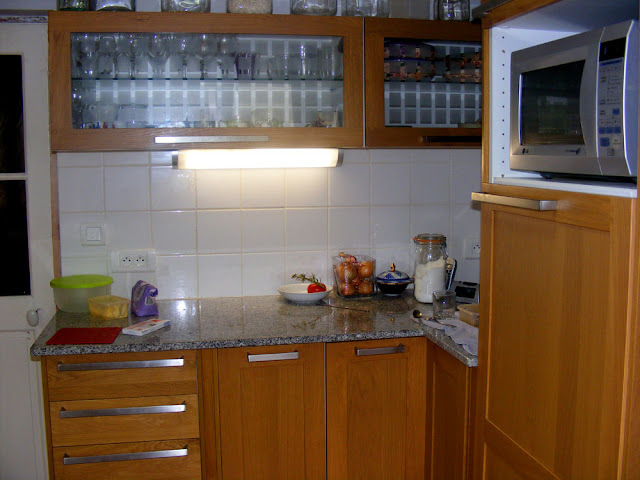 Now one can switch the dining room light on or off from by the sitting room door or near the kitchen door without it seeming like a foolhardy thing to be doing. The new kitchen bench light does its thing. In addition, he's attached the under cabinet light over the kitchen bench, narrowly failing to electrocute himself in the process. 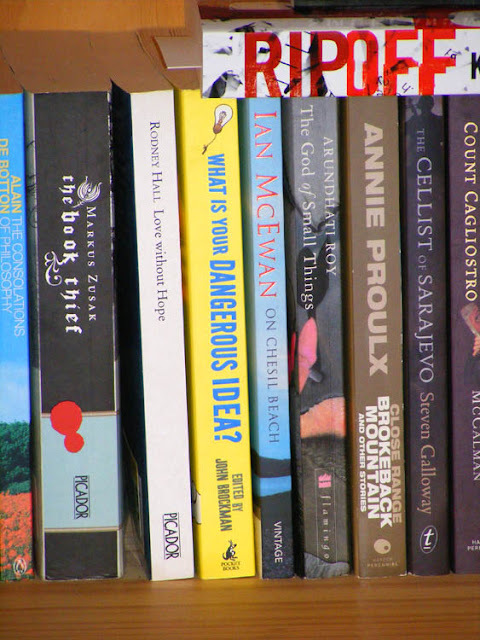 Previously we had been using a desk lamp sitting in the angle of the bench, plugged in to one of the kitchen appliance powerpoints, while a piece of bare live cable stuck out from under the glasses cabinet. The newly installed light is nicer than I remember it being. I'd had my heart set on a rather expensive light that we reluctantly decided we did not wish to spend the money on, and we were having difficulty sourcing it anyway, so we bought a cheaper, less stylish one. With some distance now, I think the bench light looks great. 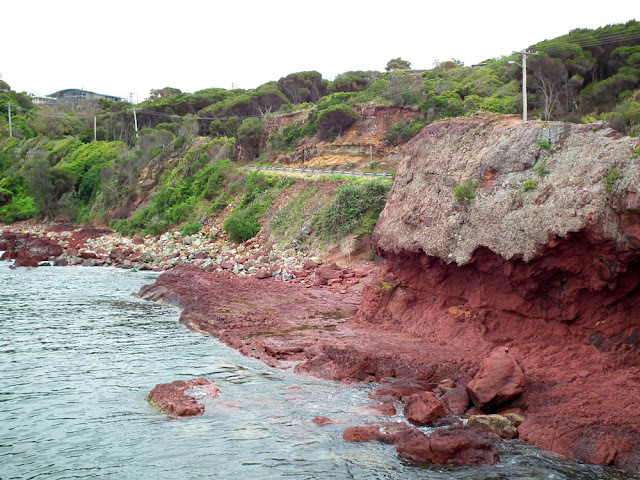 The dramatic red rocks on the shoreline either side of Merimbula Old Wharf, New South Wales. 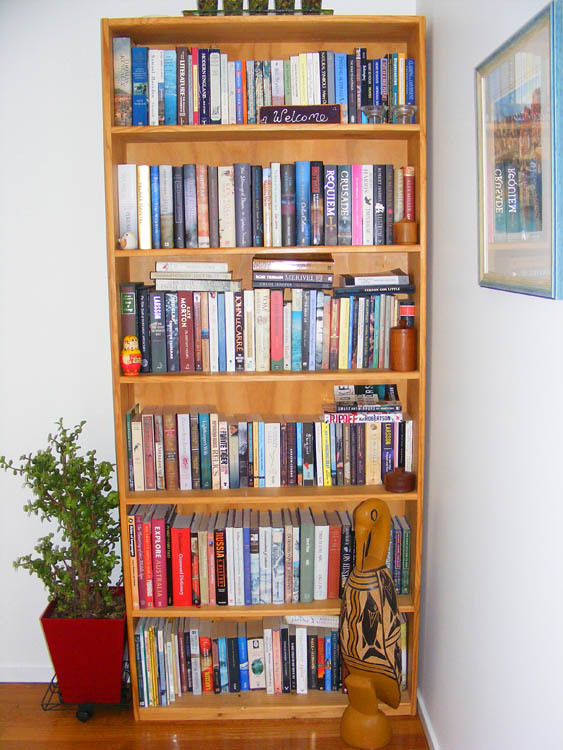 So what might you get on the well read Australian's bookshelf? Here's a random selection in a friend's house. I have two local survey areas which I monitor for STERF, the long term butterfly study run by the National Natural History Museum in Paris. 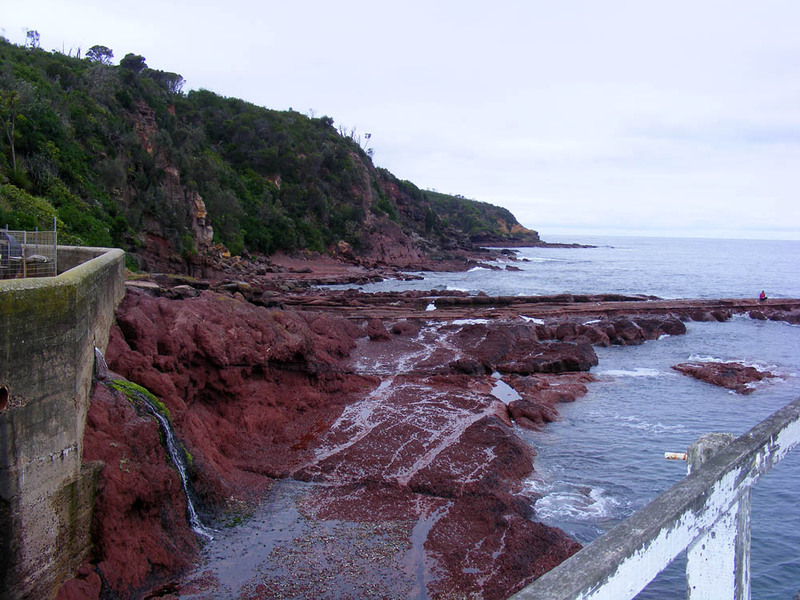 The first area is around Chaumussay, and the second around Boussay. The Boussay transects are all wetter than the chalky Chaumussay ones, and include some wet natural grassland (dominated by Purple Moor Grass Molinia caerulia), some brande (Besom Heath Erica scoparia scrub) and some forest and hedgerow as well as one transect which runs along a track between two arable fields. A male Dainty Bluet damselfly Coenagrion scitilum, lurking about in the Purple Moor Grass. While I was photographing him he zapped across to the next blade to catch and eat a small black gnat that had foolishly landed there. 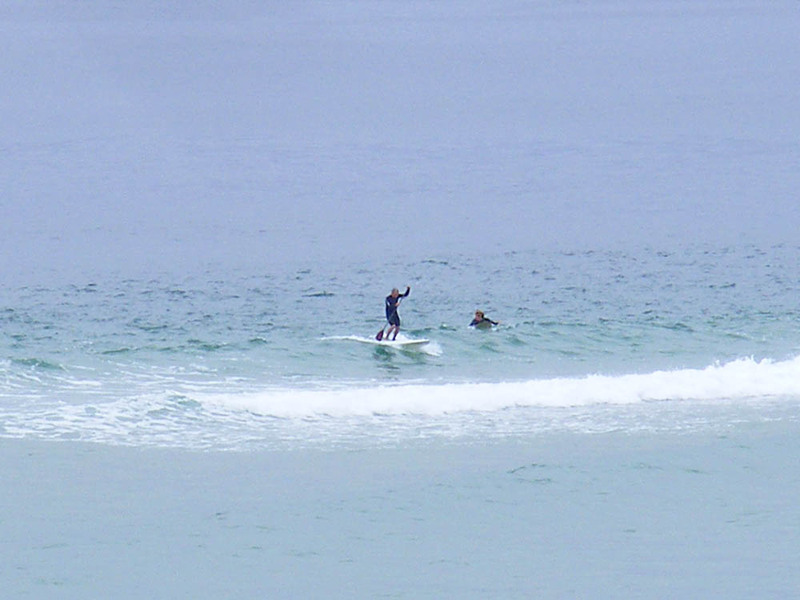 On my 6 June survey, conditions were much the same as I've described for the day before at Chaumussay. If anything, it was hotter, with very little cloud, but there were still hardly any butterflies. On these lusher, less calcareous sites, the only butterfly in any numbers was the Wall Lasiommata megera (not a species I would particularly associate with wet sites, but they like grassy sunny tracks on the fringes of woodland or bounded by hedges). At the end of the survey I popped over to the village of Boussay to check the limestone ridge there for orchids too, so once again I saw more orchids than butterflies. It's not the wet that has delayed the butterflies on the Boussay transects -- some of the species I have recorded here in previous years like damp sites. 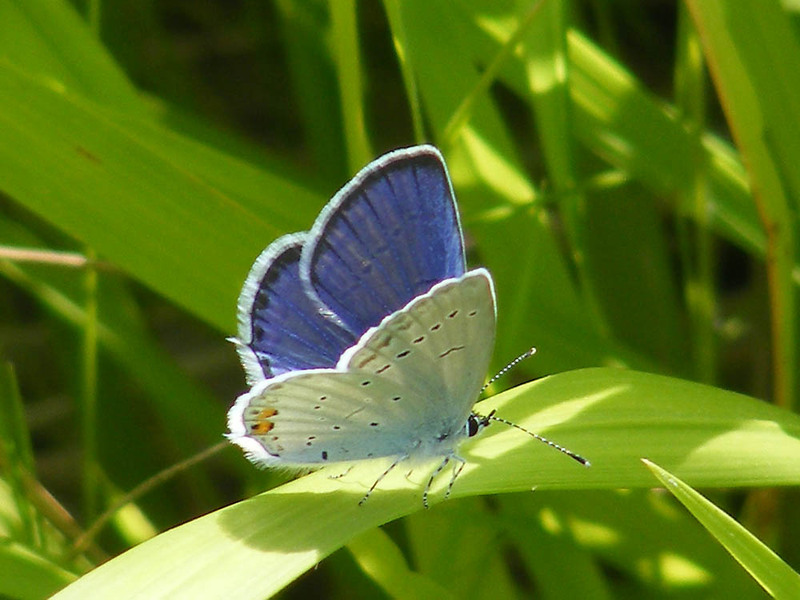 It has to be the low maximum temperatures in May delaying the adult butterflies on the wing. A female Violet Oil Beetle Meloe violaceus munches a Buttercup Ranunculus sp leaf. The butterfly selection was so poor on this survey that I didn't even bother to take a single photo of a butterfly during the afternoon. I did, however, see a wide variety of interesting wildlife, including a Western Whip Snake Hierophis viridiflavus crossing the path in front of me, head up and hissing; and a swarm of Honey Bees Apis mellifera gathering in a Common Hawthorn Crataegus monogyna on the edge of the forest. 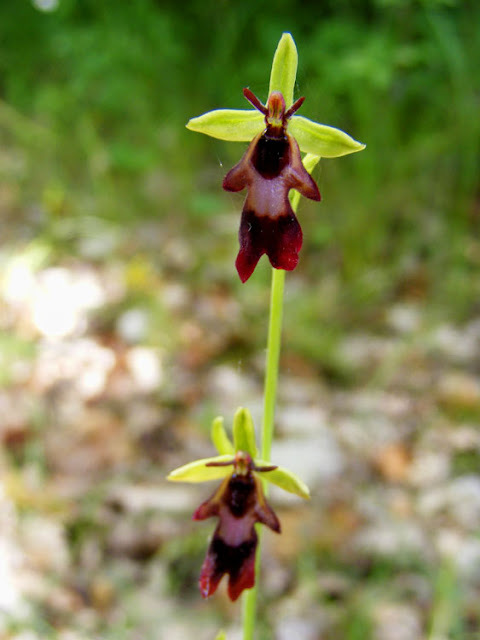 Fly Orchid Ophrys insectifera, so called because the flowers are supposed to look like flies. Personally, I think they look like a Viking wearing a babygrow (or possibly a Winston Churchill style velour onesie). 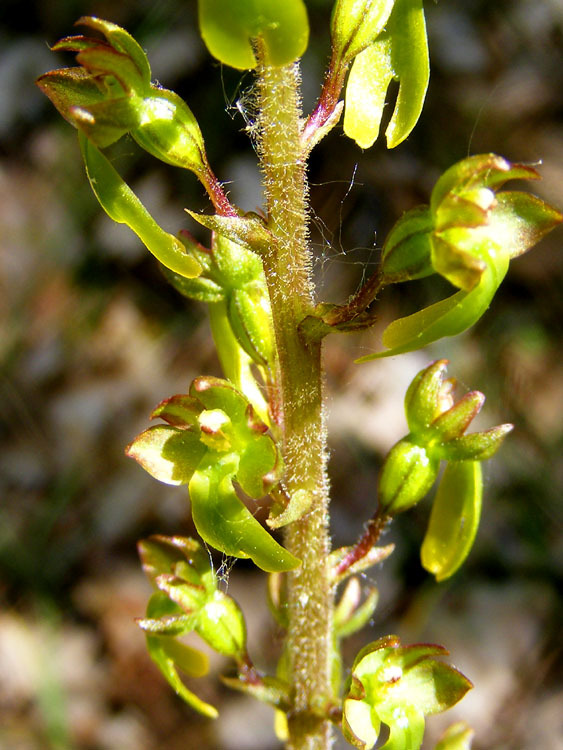 Like most small, demurely coloured orchids, Twayblades Neottia ovata are worth a closer look. 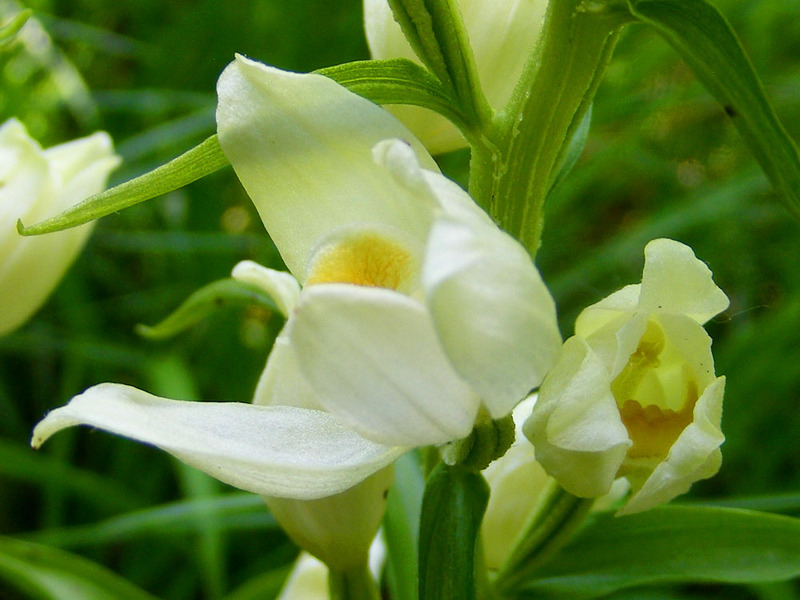 Narrow-leaved Helleborine Cephalanthera longifolia -- bright egg yolk orangey yellow in the throat, pure white flowers and no bracts at the base. 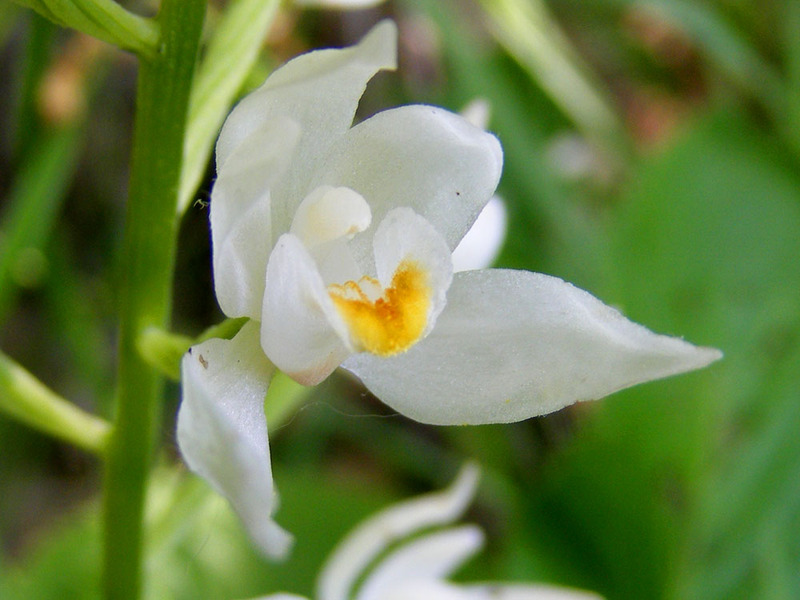 White Helleborine C. damasonium -- slightly dirty lemon yellow in throat, creamy coloured flowers, each with a bract at the base of the twisted ovary. Greater Butterfly Orchid Platanthera chlorantha. 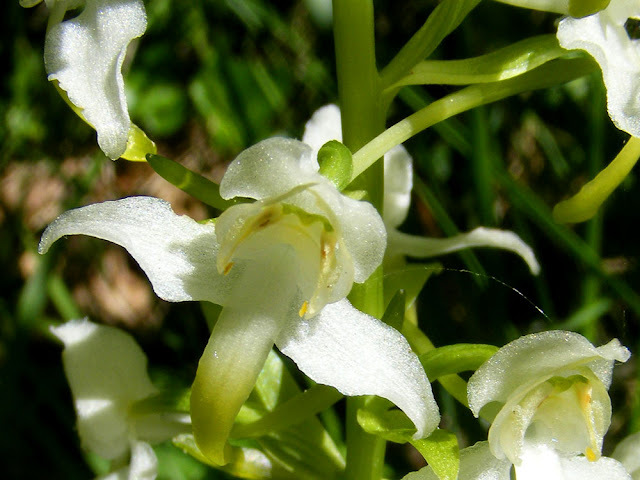 pollinated by long-tongued moths attracted to its vanilla scent at dusk. You can see the nectar reward in the tip of a flower spur appearing over the 'right shoulder' of the flower facing you. 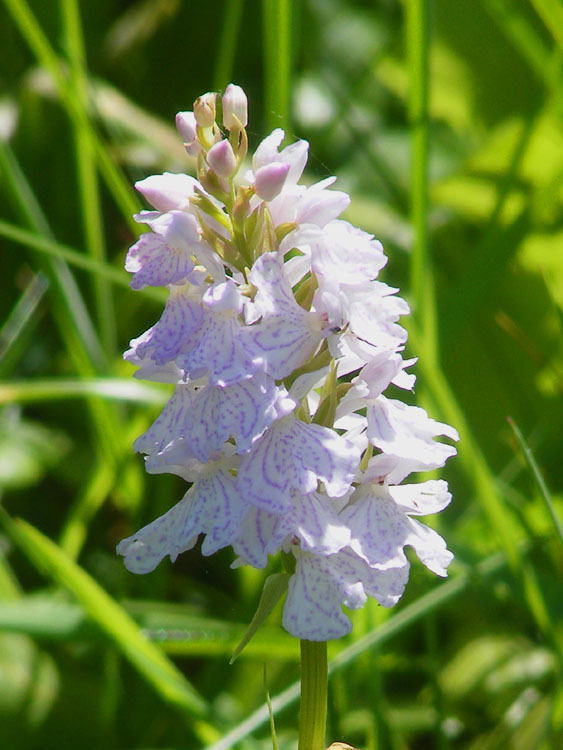 One of only three species with spotted leaves, out of 40+ wild native orchids growing here, Heath Spotted Orchid Dactylorhiza maculata is also one of the few local orchids that does not grow on the calcareous sites. Violet Limodore Limodorum abortivum -- who'da thunk such a glamorous flower was a parasite?